Excellent companian to the writting instructions included with the MicroPond Kit. Step-by-step, scene-by-scene instructions ensure a successful water garden project for the do-it-yourselfer! 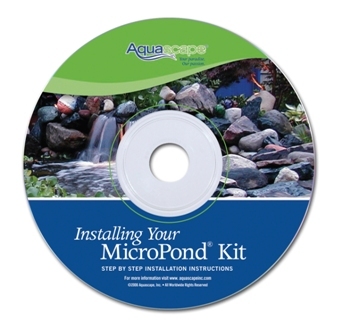 A must have if you are installing one of our MicroPond Kits and do better with visual instructions. To view the written Signature Series MicroPond Instruction Manual (English only) in a Down-loadable PDF file that can be printed, click on the link at the end of this statement. When you are finished with the PDF file , click your browser's BACK arrow (located in the upper left corner of your screen) to return to this page. "DOWNLOAD WRITTEN INSTRUCTIONS"